Clarence Thomas is an American judge, lawyer, and government official who currently serves as an Associate Justice of the Supreme Court of the United States. Thomas succeeded Thurgood Marshall and is the second black American to serve on the court. 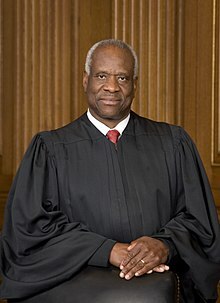 Clarence Thomas (born June 23, 1948) is an American judge, lawyer, and government official who currently serves as an Associate Justice of the Supreme Court of the United States. Thomas succeeded Thurgood Marshall and is the second black American to serve on the court. Thomas grew up in Savannah, Georgia, and was educated at the College of the Holy Cross and at Yale Law School. In 1974, he was appointed an Assistant Attorney General in Missouri and subsequently practiced law there in the private sector. In 1979, he became a legislative assistant to Senator John Danforth (R-MO) and in 1981 was appointed Assistant Secretary for Civil Rights at the U.S. Department of Education. In 1982, President Ronald Reagan appointed Thomas Chairman of the Equal Employment Opportunity Commission (EEOC). In 1990, President George H. W. Bush nominated Thomas for a seat on the United States Court of Appeals for the District of Columbia Circuit. He served in that role for 16 months and on July 1, 1991, was nominated by Bush to fill Marshall's seat on the United States Supreme Court. Thomas's confirmation hearings were bitter and intensely fought, centering on an accusation that he had sexually harassed attorney Anita Hill, a subordinate at the Department of Education and subsequently at the EEOC. The U.S. Senate ultimately confirmed Thomas by a vote of 52–48. Since joining the court, Thomas has taken a textualist approach, seeking to uphold the original meaning of the United States Constitution and statutes. He is generally viewed as the most conservative member of the court. A strong supporter of the Second and Tenth Amendments, Thomas has often approached federalism issues in a way that limits the power of the federal government and defends the rights of state and local governments. At the same time, Thomas' opinions have generally supported a strong executive branch within the federal government. Supreme Court justice opens up in an 'Ingraham Angle' exclusive.